UOX3 has been dragged kicking and screaming into the 21st Century! The source code for UOX3 and various tools have been migrated to GitHub, with the commit history of both the old SF repositories (UOX3 and OpenUO) merged into one, brand new shiny looking git repository. In a similar vein, a presence has been established for UOX3 on Discord! Join #uox3 on Discord today and idle afk forever for a good time! As always, the Downloads-page contains the good stuff. The complete changelog is available here, while a shorter summary will follow below. Fxd issue intrdcd in prev ver where any char-spcfic tags strtng with the lttr 'B' would not be loaded crrctly frm the wrldfiles. Point your mouse over this link and left-click to be rewarded with the downloads-page for UOX3 0.99.2b! Time for another version! This one, just like the previous one, is available from the Downloads-page. As with the previous version, UOX3 v0.99.2 is a relatively small release, though it contains some nice fixes related to item-weight, LoS and - for linux - server crashes, so upgrading is highly recommended. A segmentation fault in Linux related to JS method GetTag has been fixed. Click here to get your hands on UOX3 0.99.2! This smaller release includes fixes for a couple of issues that were overlooked in the release on monday, plus a few other bits and bobs. You can download UOX3 v0.99.1 from the Downloads-page. Futureproofed map-loading/reading code to support both UOP-wrapped and regular maps on a map-per-map basis. May not never need to, but still. Added new DFN-tag for creatures - "HUMAN". This now replaces the hard-coded list of "human" body IDs that is checked when playing animations, sounds, etc. Added new item to DFNDATA/ITEMS/MAGIC/reagents.dfn: bagofreagents - a bag containing 30 of each basic reagent. Grab it from the Downloads-page! The year 2012 - say hello to UOX3 0.99! Fresh off the compiler, UOX3 0.99 is now available from a Downloads-page near you. Now, how does one go about writing release notes for a new version of a program that has not had a proper version released in over three years? The CVS has received some updates, and we did put up some "experimental builds", but the version on the Downloads-page has been stuck on the same version for over three years. This is not ideal. However, this does mean we've got a changelog chuck full of good stuff for this version! The full changelog of changes done since the last proper release amounts to ~320 lines of text, a little less than half of which were done in 2012. This list includes both changes that have already been available through CVS and experimental builds, as well as a whole bunch of never before seen changes, fixes and additions that will hopefully be of some interest to people. The entire changelog is available here, however a summary of the most important changes will follow. Why are you still reading this? Go grab UOX3 0.99 already! 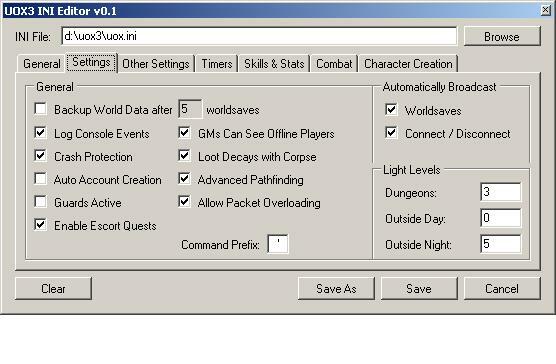 A new version of UOX3 will be released in the not distant future, which will drag UOX3 kicking and screaming into the 211th decade by including support (login, character-creation, tiledata, multis, items and maps) for UO clients all the way up to 7.0.23.0, by breaking through various packet and data-related barriers in versions 6.0.14.2, 7.0.9.0, 7.0.13.0 and 7.0.16.0 - while keeping backwards compability with older clients back to the 4.0.x versions. That's not everything, though; below follows a short overview of the major improvements in this version. For more details on each point listed, check the linked forum thread at the bottom of the list. We've also added a very important new section to the forums dedicated as a place where anyone and everyone can post fixes, additions and improvements they would like to see included in UOX3 - the Submissions - Fixes & Improvements-forum! JS, DFNs, Code, Documentation-updates - anything posted in this forum will be considered (though not everything will be approved) for inclusion in the default UOX3 package. As explained in a recent post on the forums, we're in the process of upgrading our forums from phpBB2 to phpBB3, and as such the front-page link will be changing from the old forum to the new in one of the coming days, once some kinks have been ironed out and we're certain the new forum is behaving as it should. This means that the two forums will co-exist for a short period of time, which also means that posts on the old made after December 24th, 05:30am (GMT) will not automatically be brought over to the new forum. Feel free to start using the new forum right now, though! It has been a while since the latest proper UOX3 release - 0.98-4.0, but there have still been various updates done since then. The source-code for these updates is of course available on the CVS, which is hosted on the OpenUO SourceForge-page. From time to time we also post Experimental Builds in the forums, which are compiled based on the CVS source-code. New NPCWANDER mode (5) for NPCs that should never, ever move. You can grab the latest Experimental Build from this forum thread. Alternatively, grab the source-code from the CVS and compile it yourself! Though it is now 2 1/2 years since the last version of UOX3 was "officially released" (which must be a new record of some sort! ), there have been updates made to the CVS every now and then throughout this period, and experimental versions of these changes have been released on the forums to users who've wanted them. Now the time has finally come to do a new full release of UOX3, however, and as a result, UOX3 0.98-4.0 is now available from the Downloads-page (or alternatively, from the OpenUO SourceForge-page). Read below for a summary of this version's updates, or check out the detailed changelog. Get it from the Downloads-page now! The first official version of Xuri's WorldBuilder in over six and a half years has now been released. Rumors has it that this version includes basic support for Vista as well as a brand spanking new installer, which drags the tool kicking and screaming into the 21st century. For those of you who have no idea what WorldBuilder is, it's a combined ingame worldbuilding utility (constructing houses, decorating your world, etc) and GM Tool (similar to CGMT/ShardAce of old, easy access to most commands and many features of UOX3). Download it and give it a try! The release-version of UOX3 v1.0, known as UOX4, is now available from the downloads page. UOX4 includes full support for the most recent UO clients, both the standard 2D client and the UOKR client, and all features currently implemented on the official UO servers are supported, either fully or partially. UOX4 is now officially supported by EA, after we've struck a deal with them that makes the continued development and optimization of UOX4 easier than ever. No longer will sudden changes to the UO client cause incompability or a breakdown of features - we'll be informed of any changes to client <-> server protocols beforehand so we can easily keep UOX4 compatible with new client releases. Support for server-clusters added: Run AI on one server, database on another, chat on a third, etc. Get it from the Downloads-page now, or discuss the release of UOX4 with other users! As of version 6.0.1.7 of the UO client, problems have started occuring when connected to emulated UO servers such as UOX3. Client lockups and freezes are very frequent, and some reports indicate a change in the packet system that could have other gameplay-affecting consequences as well. For now, we advice you to hold those client updates for the time being, until more information/a fix to UOX3 is available. The resident coding wizard - giwo - has conjured up a much needed and long awaited utility with which shard admins easily can modify the general UOX3 settings stored in the UOX.INI file without having to trudge through the file manually in a text-editor. Instead, you can now navigate through a tabbed GUI (img) with all the options laid out in an orderly fashion. You can download and/or stay up to date on the latest versions of the UOX3 Ini Editor by browsing to this thread in the forums. Another version of WorldForge has been added to the Downloads-page; a modified version (by grimson) of the one already there, it includes support for maps sized 7168x4096 as well as some smaller fixes to the overview map. UOX3.org has been unavailable during the last few days due to a change of webserver host. The changeover is now more or less complete and the page should be showing normally, though some details yet remain to get up and running (such as the forum). If you encounter any new errors on the page, don't hesitate to let us know so we can fix it. It has been pretty quiet around here for a while now, but we're still around, and we hope you'll all have a very Merry Christmas, whether you celebrate the day(s) or not. It must also be mentioned that for the time being any and all new forum accounts must be activated by an administrator before they can be used. Manual activation has been disabled due to the huge amount of spambots that keep registering. Until a solution can be found (either through upgrades to the forum software or by add-ons), it might take a day or two for new forum accounts to be activated. Just received an e-mail mentioning that authorization e-mails for newly registered users on the forums weren't being sent - the problem has now been fixed, and new users since 25th of July have all been manually activated. RSS newsfeeds for UOX3 have been added for both the UOX3.org news-page (in the front-page menu) and the forums (in the forum header), along with Opera Widget-versions of said newsfeeds (screenshot). Note that version 9.0 or newer of the Internet Browser Opera is required to use the Widgets. Three months have passed since the previous UOX3 version was released (though any changes and updates are always available directly from the CVS at any time after they've actually been made), but now we're back on the release track with UOX3 0.98-3.7, which is available from the Downloads-page. JS method TextMessage has two new optional parameters; allHear and txtHue.